Baking sugar cookies cut into whimsical figures and decorating them is an annual holiday tradition in many homes. This is a wonderful recipe to start your own holiday baking tradition. Let the younger set get in on the act, and assign them to "sprinkles patrol". In a medium bowl, combine flour, baking soda and cream of tartar; set aside. In large mixing bowl, cream together the butter and powdered sugar until fluffy. Add egg and extracts and beat well. Stir in flour mixture until just mixed. Cover and refrigerate dough for at least 2 hours. Divide dough in half. Roll each half 1/4-inch think on a lightly floured surface. 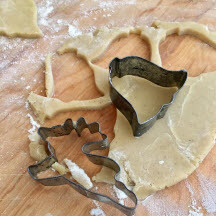 Cut into desired shapes with 2 to 2 1/2-inch cookie cutters. Place cookies about 2-inches apart on baking sheets. Bake on top rack of oven for 8 to 10 minutes or until edges are lightly browned. Transfer to wire racks to cool. For Thin Icing: Mix together all ingredients until smooth and thin enough to brush onto cookies using a pastry brush. If icing is too thick, add small amounts of milk at a time until consistency works for you. Tint with food coloring, as desired. Brush cookies with Thin Icing and decorate with an assortment of cookie sprinkles. Allow to air-dry completely before storing in airtight container. Makes 4 dozen or 48 cookies. Nutritional Information Per Serving (1 cookie with icing): 61.0 calories; 58% calories from fat; 4.0g total fat; 14.7mg cholesterol; 55.6mg sodium; 21.9mg potassium; 5.3g carbohydrates; 0.2g fiber; 0.3g sugar; 5.1g net carbs; 0.9g protein.